From time to time people will undergo surgery; some to repair damage caused by trauma, dental implants, and others to improve the aging process or birth defects. Whatever the situation, Autologous Platelet Concentrate enriched with growth factors (APC+) is one tool used by surgeons to help improve surgical outcomes. Understanding how your body’s natural growth factors may help accelerate the healing process is important information you will want to know about if you are in need of a surgical procedure. What are growth factors? Platelets contain potent growth factors necessary to begin tissue repair and regeneration at the wound site. Growth factors derived from platelets initiate connective tissue healing, bone regeneration and repair, promote development of new blood vessels, and stimulate the wound healing process. What is Autologous Platelet Concentrate (APC+)? APC+ is composed of platelets and plasma. Platelets are tiny cells that are partially responsible for causing blood to clot. Platelets also contain large reservoirs of natural growth factors. While a normal concentration of platelet circulating in your blood is 200,000 per micro liter, the platelet count in PRP can exceed 2 million platelets per micro liter. APC+ is made from a small sample of your own blood (approximately 1 ½ oz.). The process concentrates the platelets found in the blood sample. These concentrated platelets contain huge reservoirs of growth and wound healing factors. Growth and wound healing factors are natural components of your body. Clinical data has shown that growth and wound healing factors may enhance and accelerate your body’s normal healing process. Why is APC+ (enriched with growth factors) preferred over other products or methods? APC+ is the only available product that contains elevated levels of all your naturally occurring growth factors. These growth factors are maintained in precisely the same ratios found circulating in your body. How long has APC+ been in use? APC+ has been in use by leading clinicians for over a decade. Doctors like Jorge E. Larrondo has been using APC+ for dental bone grafts and soft tissue grafts to stabilize the graft material. 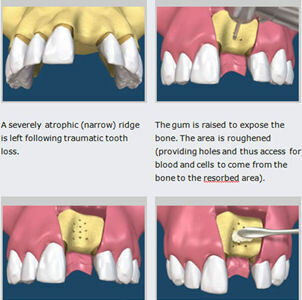 He is using APC+ to help fixate bone grafts as well as accelerate bone growth in dental implant procedures. APC+ will help seal wounds and accelerate soft tissue healing in facial plastic and cosmetic surgeries as well. If you are considering or require a surgical procedure, such as a dental implant, you will want to call Dr. Jorge E. Larrondo of Larrondo Dentistry and ask him about APC+. You will want to ask him how APC+ is made and what is required from you and how long will this procedure take. Is APC+ for you? The use of APC+ is considered by many to be a “new frontier” of clinical therapy. Dr. Jorge E. Larrondo of Larrondo Dentistry has been serving Hemet patients for seven years. Dr. Larrondo office is located in Hemet on 160 South Santa Fe street to serve you better. Visit https://www.hemetdds.com for map to this location. Or, feel free to call Dr. Larrondo at 951-925-6596 and he will be happy to answer your questions concerning APC+.